Today the flying rats (squirrels) ripped the cover on my 84 Camaro to shreds - see attached pic. They use the cover material to help keep warm in their nests. I've tried putting Cayenne Pepper and moth ***** on covers but it doesn't work. Any advice on how to stop them from doing car cover destruction would be appreciated. 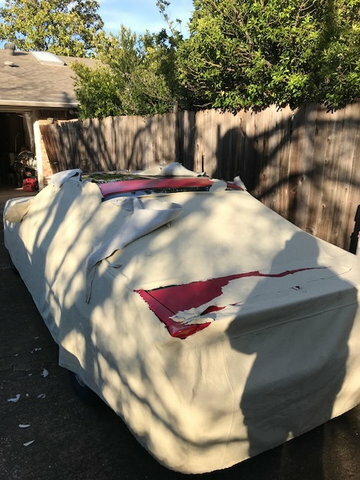 Any advice on how to stop them from doing car cover destruction would be appreciated. We never had squirrels growing up because all the little boys had a Daisy. I prefer the purring murderer of vermin, myself. Highly recommended. She rarely gets a Squirrel, but mice, rabbits, spiders, slow birds, errant poodles... The squirrels are generally confined to the trees if they're not running for their lives. That's hilarious! In fact, my neighbor's cat spends a lot of time in my back yard and I did see her chase a squirrel once. It got away. Oh yea , If I came home to find that and knew squirrels had done it , it'd be game on ! Ha ha! Where I live for years the city has been pushing an endless campaign to eliminate all stray cats or make sure they are all neutered so now are very few feral cats around if any. Those cats were the natural predators that kept the squirrel population in check. Today squirrels are treated like an endangered species and so their population has exploded over time. So now everyday I've got about a dozen squirrels on the ground running around unafraid like they own the place. They are a total menace and highly destructive. Most people don't realize they are a member of the RAT family! I hate them! Wow...I'm surprised the cayenne pepper and moth ***** didn't work. I know they make a spray repellent, but I'm not sure how well it works. The only thing I can think of is putting one of those fake hawks people put in gardens to try to scare them away, but those only seem to work half the time. Sorry that happened to you, I know that has to be aggravating! Yes, it's very annoying. They have destroyed several of my covers over time. After its been raining cloth covers become easy for the squirrels to rip apart like a paper towel. Also, we have a lot of Falcons in the neighborhood and they are huge. I am sure they get some of the squirrels but the vermin is breeding so fast I think only cats would be able to contain the situation. Didn't the Beverly Hillbillies eat squirrel? Nothing works better than a cat.. Drew is right..
We solved our mouse problem in our barn by bringing home a 5 month old kitten to live in the barn. He is in a big 5 foot tall crate with different levels, toys, blankets, litter box, etc. Just trying to get him used to his house so he doesn’t run away. He seems to like it now.. Even with the cat in the crate, the mice are gone. This cat can climb too.. I don’t think squirrels in trees will be very safe either..
We got him from a lady who had barn cats that kept having babies.. She has like 15 cats right now..
We have Nest cameras in the horse stalls and could see the mice crawling on the horses to get warm and looking for food.. We might not be seeing as many bunnies in the yard either which will bum out my wife, but something needed to be done. I agree with you completely. There is a young feral female cat that spends a lot of time in my backyard. I put out food and water for her everyday but she keeps her distance. I have seen her catch mice, lizards and snakes. She chases the squirrels but they are faster than her. Whenever they see her a few of the squirrels start barking out the warning to other squirrels to look out for the cat. Hopefully, someday soon she'll kill one of them. The squirrels have now destroyed 3 car covers in the last week. I am now trying a new strategy. Last night I put an entire jar of cayenne pepper on a car cover and this morning the squirrels haven't done any new damage. If this works, it means you have to basically cover the entire cover with A LOT of pepper to deter them. After it rains tonight I will have to reapply more cayenne pepper. It's a lot cheaper than buying new covers. I'm currently at war with the mice in my pre WWII garage so I know your pain. What are the mice attacking? Wiring in the engine bay or are they after car covers? Yes, I tried leaving car cover scraps (from the first cover they shredded) on the ground and I hung pieces on the fence but they never touched them. They only go after the material on top of the cars. So far today they didn't do any damage apparently because I put a lot cayenne pepper on the cover. The cover looks bad with all that rust colored pepper on it but hopefully it will continue to work. It might be a bad idea to let hot pepper lay on the paint. * Or open a shooting arcade. The ones on the ground are the ones you take. * Another option is to trap and drown. * Or get rid of the cover. [NY] Car cover. Expensive qaulity. ****ing Car Wash Destroyed My Paint Job!